Incredible 30X optical zoom performance in a compact and robust package. Ideal for mobile field surveillance. 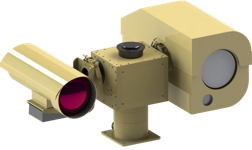 LWIR uncooled thermal infrared imaging paired with a surveillance-optimized HD visible zoom camera. Ideal for marine, fixed or vehicle applications. MIL-810-STD military grade, gyro stabilized, ultra long range EO-IR (electro-optical infrared). Our premiere integrated turn-key surveillance camera system. High definition day/night imaging, ZLID (Zoom Laser IR Diode) illumination up to 600m. A versatile, all-weather nighttime surveillance camera system. We have also supplied surveillance systems for the US Army and Navy as well as numerous other military and law enforcement groups around the world. Customer support at Infiniti begins before you even receive any product. Since each system is a custom build, you will be directly in touch with a sales person throughout the whole consulting and design process as we customize an integrated system to your needs. We keep in touch with you at every step of the way, ensuring that you will have the most effective project possible.